Andrea Gillis Petite Residency at Atwoods.877 Cambridge St, Cambridge, Massachusetts. Wednesdays, April 5 and April 12. 10pm shows. Jude Torres (Walter, HAIR) will be appearing in Moonstruck Theater Company‘s production of West Side Story playing the role of Riff. April 7-9, 2017. This show is sold out! 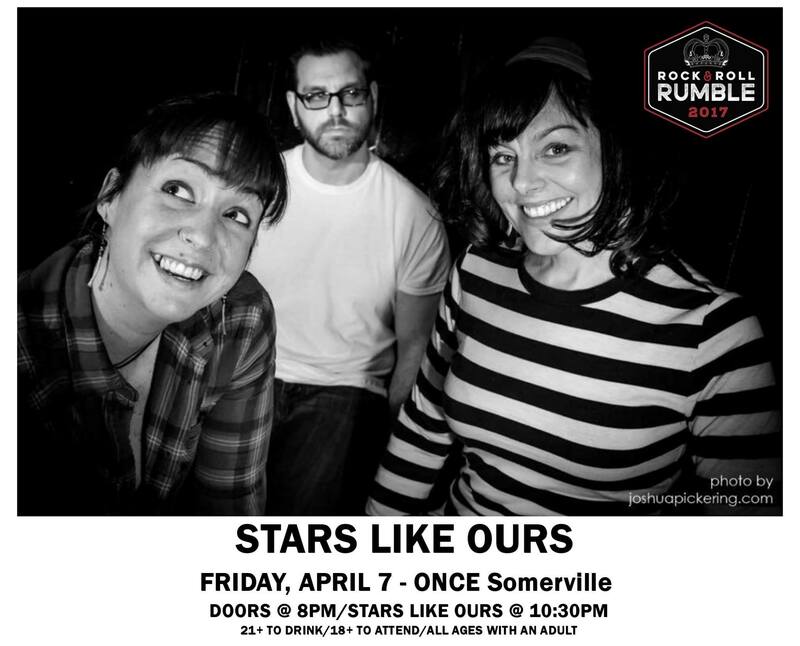 Stars Like Ours (featuring Michelle Paulhus) will be competing in the Rock and Roll Rumble on Friday, April 7th. ONCE Ballroom, 156 Highland Avenue, Somerville, MA 02143. Check out Taco Mondays at ONCE anytime for intimate music nights, tasty tacos, quirky drinks, and one of the nicest hangouts in Somerville. Maybe you’ll see us planning our next show. Also on Friday, April 14th The Peasants, Road Soldier, Not to Touch the Earth featuring Kameelah Benjamin-Fuller are at Danny Sullivan’s, 102 Irving St., Framingham, Massachusetts 01702. Dig It? Amanda White’s Birthday Show! with the James Rocket. Saturday, April 15 at 10 PM, the Lilypad, Inman Square. 1353 Cambridge St, Cambridge, Massachusetts 02139. Rare Boston appearance by Amanda’s NYC based band. April 29th, This Bliss, Body English (featuring Clinton Degan), and The Nickel and Dime Band, with the legendary Rick Berlin, are at Lizard Lounge Cambridge, 1667 Massachusetts Ave, Cambridge, Massachusetts 02138. The Revelations Gospel Brunch featuring three BRO powerhouse voices; Erica Mantone, Jennifer D’Angora, and Andrea Gillis, are at Atwood’s, 877 Cambridge St, Cambridge, Sunday, May 7th, 11:30 – 2:00. (This monthly residency continues on the first Sunday of each month).